Children’s ministry is unique in the life of the church. It is simultaneously one of the most challenging and rewarding ministries. There are few ministries in the life of a church that can leave you exhausted and refreshed quite like working with kids. On any given week, children’s ministry leaders and servants can be found running, crawling, jumping, shouting, whispering, laughing, crying, smiling, and frowning. Leaders in children’s ministry are caretakers, teachers, playmates, mediators, parental figures, and role models. These roles, when fulfilled, produce tired bodies and full souls. Ministering to kids is exhausting. Yet, there is nothing so satisfying as seeing kids learn deep biblical truths for the first time, begin to trust Christ, and grow in intimacy with him. "But as for you, continue in what you have learned and have firmly believed, knowing from whom you learned it and how from childhood you have been acquainted with the sacred writings, which are able to make you wise for salvation through faith in Christ Jesus" (2 Tim. 3:14-15). John Calvin agreed. He believed the teaching of children was fundamental to the future of the church. He once wrote, "Believe me, the Church of God will never be preserved without catechesis," that is, the teaching of basic bible doctrine to children. Likewise, Puritan Thomas Watson once said, "To preach and not to catechize [teach] is to build without foundation." If you serve in children’s ministry, know that your work is most valuable not only for the spiritual formation of the kids you teach, but also for the future of the church. You are not just a babysitter. For some kids, you are a trusted and invaluable partner with their parents as they disciple. For other kids, you may just be the only source of love, grace, and truth they will ever see. Your labors will, for better or worse, shape the way children view the Bible, God, and the church for many years to come. Not many of us forget our teachers. If you lead or serve in children’s ministry, Lord knows you aren't in it for personal glory. But never forget that you are in children's ministry for glory. Children's ministers and servants are laboring for the glory of the Lord in the little hearts and minds of boys and girls. We are praying, teaching, loving, and leading children for the praise of the glory of the grace of God in Christ. So, I pray my fellow children's ministry leaders and servants find deep satisfaction in our often difficult and thankless work. I pray we find satisfaction in presenting the gospel to kids. I pray we find satisfaction in teaching small kids big truths to blow their minds and ground their feet. In a culture that is constantly shifting, I pray we resolve to continue teach children the immovable truth of the gospel even if we don't see any results in our time with them. As Charles Spurgeon wrote said, "Oh, that the Spirit of God may help us to do this! 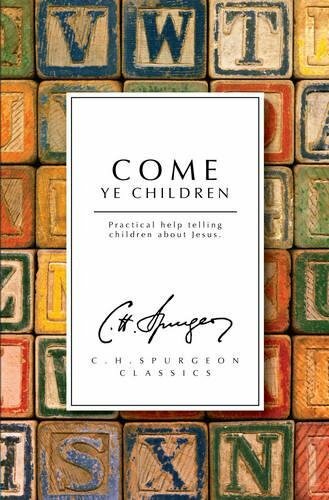 The more the young are taught the better; it will keep them from being misled" (Come Ye Children: Practical Help Telling Children About Jesus, pp. 10-11).